My name is Dr. Rebecca Butterman. I'm a psychologist and I also write an advice column for the brokenhearted readers of Bloom! magazine. Family dysfunction? I know about this both professionally and personally LOL. And don’t you find that the holiday season sometimes makes problems feel worse? Hollywood movies and Norman Rockwell paintings twist us up by having us believe that everything should be perfect for Thanksgiving and Christmas and New Year's and Hanukkah. The holidaze, I like to call them. You pull together full-grown members of a family and put them in close contact for days—they are going to fall back into ugly, old patterns. I promise you that! Even my friends at our picture-perfect church on the town green aren't exempt from problems. I found that out recently when our minister called me at midnight to talk about the death and possible murder of another church member. Whoa! And naturally, he wants me to help figure things out. Some people wonder how I—being a professional—handle my stress. One of my favorite distractions is cooking. It doesn't have to be fancy, as long as it's good old-fashioned comfort food. Here's my easy recipe for baked apples, which will make your house smell like you've scored the best of Christmas. And make your stomach happy and turn your heart in that direction, too. This recipe serves two, but it's easy to double or triple it up. Core the apples, making sure not to cut all the way through to the bottom. In a small bowl, mix the butter, oats, sugar, and cinnamon well. Divide the mixture into two parts and stuff into the apples. Bake for about 45 minutes in a 350 oven, until the filling is crispy and bubbling, and the apples soft. You can add ice cream or whipped cream if you wish, but I find these apples are perfect by themselves. Giveaway: to celebrate the ebook publication of PREACHING TO THE CORPSE, we are giving away a signed paperback copy of the book. Perfect to stuff into a mystery lover’s stocking! To enter the drawing, tell us your best tip for staying sane during the holidaze—and don’t forget to leave your email! 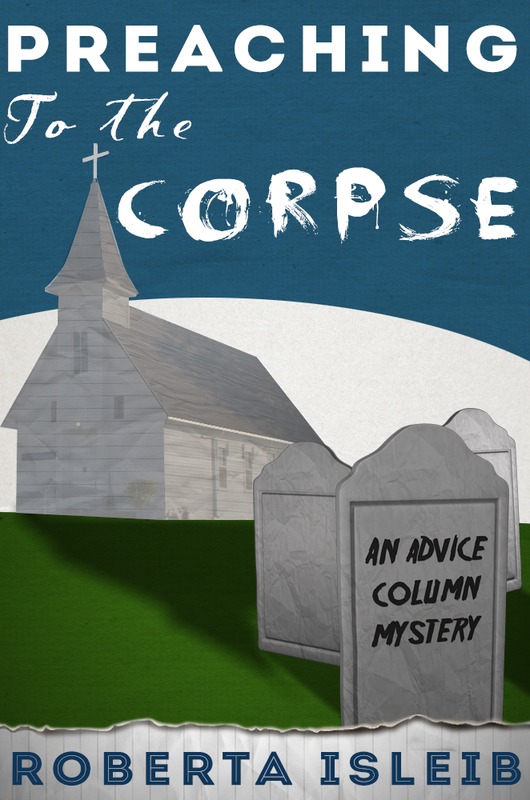 The first advice column mystery, DEADLY ADVICE, is also available as an ebook. 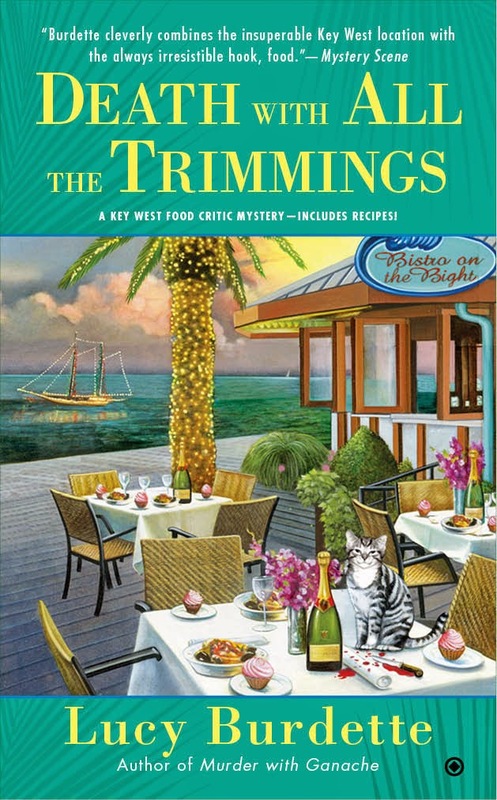 And Lucy Burdette's fifth Key West mystery, DEATH WITH ALL THE TRIMMINGS will be in bookstores December 2. You can preorder it now! More breaking news! If you *forgot* to buy your ebook copy of AN APPETITE FOR MURDER, it's on sale for $1.99 through the weekend! Here's the Amazon link, and here's the link for Barnes and Noble. When it gets too crazy and my to-do list is so long it should be rolled around a toilet paper roll, I try to remind myself that just because something was once a tradition, it does not need to be one forever. Just because my mom did it or the kids loved it when they were small does not mean it has any special meaning now; it's okay to keep the memories and let the activity go. Everything doesn't have to be a big surprise orchestrated by me, either. It doesn't always work, but I try to focus on where we are and who we are with and what seems to be making people happiest right now. First of all, my grandma used to make baked apples and they are such a memory trigger for this time of year! Thanks for sharing the recipe! I like to make sure I take time to stop for a cup of tea or cocoa and read, to help distance myself from some of the holiday craziness. Thanks! Organization is the key to efficiency, so think ahead, make lists, compartmentalize so that you don't get overwhelmed, prioritize, and get help from others! My tip is to schedule in some quiet time, even if it's just an hour to read or watch TV. I allow time to relax and not think of everything I have to do next! Get things done ahead of time so you are not rushing, and get the family to help out with things. I'm having to rethink the whole holidaze. I love the decorations and lights but now my husband retired and we head south for a few months. Which means very few decorations and lights. And no snow. That makes me sad. So I am having to learn new things to help me through the holidaze. The recipe looks great! I think I will have to try that today. Cutting back on gift giving, reading, snuggling with my cats and plenty of naps. This apple recipe is sure to be delicious. Through the years I've tried many ways to try and reduce holiday stress. The best results so far have come from letting my kids take the food preparations over in their homes. I buy a couple of bottles of wine for the hosting couple and buy snacks for the crowd. Also, gift giving is cut way back and I give money to the kids so I don't have a lot of wrapping to do. I always felt so much pressure before Christmas as not only did I have to clean the house, decorate the house, shop, wrap and participate in events for the kids' schools...and probably things I don't remember now. Advanced age has its rewards. I appreciate all that my kids do these days. You guys are so smart--delegate, plan ahead, take time for yourself! Love hearing these tips! I'm a single senior - so I just nap! We do a potluck dinner - the host makes the turkey and the other guests bring the side and desserts. I hide away, for even a short time, & dive into a book. The ultimate escape. The way that I stay sane is that we've cut back on the gift list. I also just cook foods that I'm comfortable with and enjoy eating myself. I'll be trying the apple recipe! I load my CD player with all Christmas Music, (some might say I'm a music junkie), sit in my easy chair, and do noting but listen to music. Ok sometimes I end up taking a little nap. Alright, so most times I take a little nap, just listening to that music. I try not to overbook, and try to keep things simple.